The intense week long course kicked off Monday 11th August at the CIFA Matavera Complex with a welcoming address by CIFA General Secretary Mii Piri . 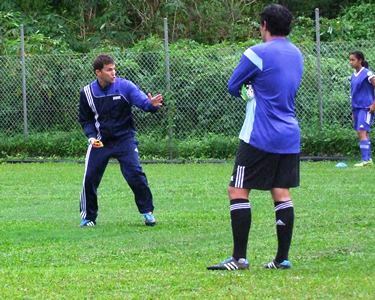 “The course is aimed to provide coaches with the ability to plan, prepare, conduct and evaluate suitable coaching training sessions for senior players” said Toselli. Participants will focus on understanding player development, coaching approaches from developing a game model to building a team and the key elements of coaching from the training process to the match. Learning activities will include practical with daily deliveries for senior players, theoretical game concept and video analysis. Concentrating on relation between players, functional capacity and game capacity will allow coaches to develop their team. Due to the high unpredictability that exists during a match, a coach tries to create predictability through preparation, planning and training. “Every training should be linked to the coach game model, respecting the principle of play’’ said Toselli. “We are now trying to develop a team performance” continues Toselli. This course will assist coaches in fostering four movements of the game, ball possession, ball possession to the opponent and the two transitions. The participants will take a final assessment at the end of the course to complete the week. They will have to be active after the course with their clubs and coach to receive their final grade within six months of practice. The coaches will be better equipped for the progression of players and providing the tools needed for those that are passionate about football to improve. CIFA is pleased to have Toselli’s involved to grow and foster the coaches and football in the Cook Islands.